Djenne is an ancient city located in southern Mali. The uniqueness of this place comes from the fact that this is the oldest sub-Saharan city. It is located in the alluvial plain formed by the rivers Niger and Bani. This beautiful city’s population today numbers about 12, 700 people and is located 354 km. from Timbuktu. The city is famous for its unique architecture, of which the Grand Mosque here is the emblem. This is a historical double-entering in the World Heritage List of UNESCO, as at the same time it is a member of the World Heritage cities. Founded in the 13th century, this city was dependent in those times on the Mali Empire. Since then, between Timbuktu and Djenne is a rivalry in trade of gold, slaves and salt. By the 17th century, Djenne became a thriving commercial and educational center. In 1670, it became part of the Bambara kingdom. Today, Djenne continues to be a trade center, the main products here are fish, coffee and cola. 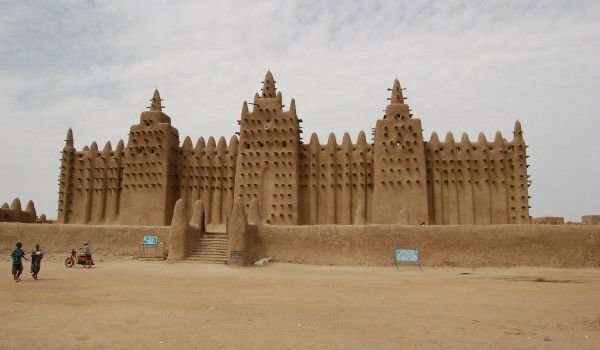 One of the archaeological attractions here is Djenne, the city dating from 250 BC. The architecture of the Grand Mosque, located on Market Square is really impressive. Built in 1240 by Sultan Kumboro, this is one of the most impressive examples of Islam in Mali. In the 19th century the local ruler Sheikh Amadou decided that this building is very impressive and allows it to self-destruct. In the 30s of the century, they built on it a small building, but in its present shape, the landmark mosque was built in 1906 and 1907 by a local master builder. The temple is built on a rectangular platform. The walls are thick 41 and 61 cm not only to withstand the massive structure, but rather to keep it isolated from the high temperatures in Djenne. The roof structure is remarkable and has removable ceramic caps, which are part of the vents. There is a tradition every spring for the walls of the mosque to be updated with local adobe and palm trees. This tradition became a festive event for the city, accompanied by an annual fair. The holiday is accompanied by a ceremonial beating of drums and chants, while women go to the mosque with water buckets on their heads and men bring a mixture of clay. There is the custom at the local celebration to be drenched from head to toe with mud.